(with frequent guest appearances by Gus Garelick (mandolin and violin) and Chuck Bennett (bass)). We play at the Caffe Trieste in the North Beach neighborhood of San Francisco twice a month on Sunday mornings from around 10:15 AM till around 1 PM. (We try to play on the first and last Sunday of each month, but sometimes we move a performance to a different Sunday, so please sign up to our mailing list). We play a lively mix of traditional Italian and European instrumentals, including several mazurkas (a sort of uptempo waltz popular in the late 1800's). 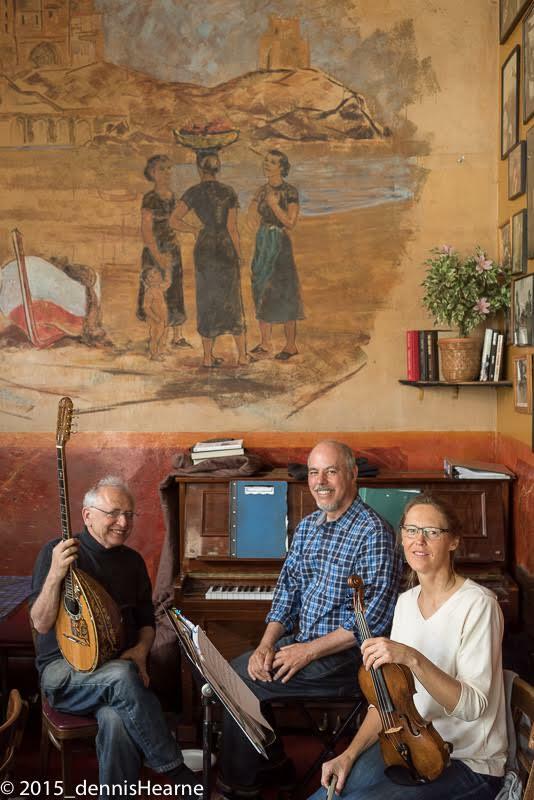 We are dedicated to maintaining the rich musical heritage of the Caffe Trieste, which includes more than 50 years of regular concerts hosted by caffe founder Giovanni "Papa Gianni" Giotta and his family.